Physics Buzz: Top 5 Discoveries of LAST WEEK!!! Last week the American Astronomical Society had their big annual meeting, full of groundbreaking discoveries. I already mentioned our home galaxy is both bigger and spinning faster than we thought before because it was too big news not to mention it. Now that the conference has finished up, I can go through and give you my five favorite discoveries. 5) Black Holes Preceded Galaxies – Since astronomers first determined that gigantic black holes live in the center of most galaxies they've been trying to figure out which came first. Did the large cluster of stars in the middle of a galaxy collapse causing a black hole to form, or did the black hole already exist and pull stars in around it. Astronomers have found that the mass of a black hole in the center of a galaxy is almost always one thousandth of the mass of all the stars in the galactic bulge. However when one peers to some of the farthest and oldest galaxies, the black holes at their center are much bigger proportionally, leading scientists conclude that the black holes likely formed first then pulled stars and material around them. 4) Stars Form around Black Hole – More about black holes. The tumultuous environment around a massive black hole like the one at the center of our galaxy seems hardly the place for a baby star to form. However astronomers were able to observe two stars forming only a few light years from the galactic center where gravitational forces should have ripped them apart. It just goes to show that there's still so much about our own galactic backyard we don't know about. 3) Magentars and Quark Stars – Ok, this one is wierd. After a large star runs out of fuel, it erupts into a gigantic explosion called a supernova, and gravity crushes down the leftovers into a super-dense material. If the star wasn't massive enough to compact down into a black hole, then it can form a neutron star. The material in them is so dense all of the electrons and protons are condensed together forming a solid mass of neutrons. It is as if the entire city sized star is a gigantic atom. Every once in a while one has a surprisingly powerful magnetic fields, dubbed magnetars, but no one was quite sure why they were so strong. Astrophysicists now think that the reason may be because the neutrons that make up the neutron stars compress to the point where they start forming a very dense material out of the neutron's fundamental quarks themselves. This would essentially make a magnetar a "quark star" and part of this very exotic material would be extremely strong magnetic properties. 2) Gas Giants have to form Fast – Planets like Jupiter form when gas and debris orbiting a star starts to gravitationally coalesce around a single location eventually creating a gas giant. After analyzing a nearby young star cluster, scientists were surprised to discover that all of the gas giant's material seems to dissipate from around a newly formed star in only a couple of million years, hardly any time at all on the interstellar timescale. This means that these gas giants have to form very quickly before all of their raw materials are gone. The solid stuffs that make up rocky planets like Earth and Mars, seems to linger longer, giving more time for smaller denser planets to form. 1) Cosmic Background Noise Louder than Expected – When a team of scientists set out to observe some of the oldest stars in the sky using a radio receiver, they were startled to discover a six times as much radio interference in their instruments than they expected. After many checks and recalibrations, the team was forced to conclude that their equipment was right and there was a lot of radio noise coming from something. No one knows for sure what though, there's no phenomenon that we currently know of that could produce so powerful a radio signal from all directions. 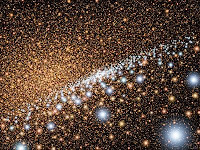 This interference will make it much more difficult to detect the very oldest of stars that the team was originally out hunting for, but an unexpected result like this is so tantalizing, because it once again means there's something still to figure out about the universe. Right now all we know, is there's something out there making an awfully loud racket.